This is Denyse's signature improvisational workshop! It's a hands-on opportunity to learn her intuitive design techniques while building a foundation for bringing your own individual style to quilts or projects from her book, or your own creations. Whether you are an experienced quilter or a beginning crafter, you will create exciting, rut-breaking work that will change the way you think about color, patchwork, and your own creativity. 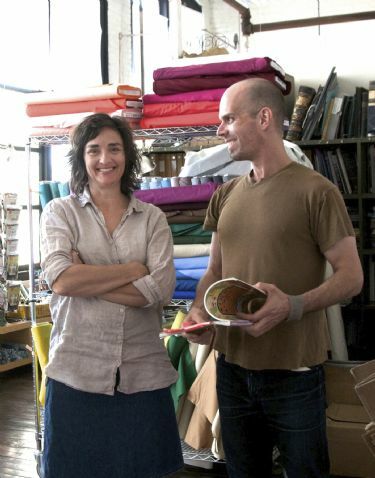 Read more about Denyse’s workshop in Time Out New York. $350 includes tuition and materials, lunch, and goodie bag. This is a one-day workshop. Class size is limited to 10 so register early! You will take home 4 to 6 quilt blocks in this workshop, and loads of inspiration! If the workshop is full, the date will not appear in the drop down menu below. Email us to be added to the wait list for any date. Prior to registration please be sure to read our Registration Policies section. A delicious lunch, snacks, and beverages; a sewing machine, rotary cutter, cutting mat, and most of the fabric you’ll need for the day. Please carefully review the information packet you’ll receive upon registration for additional details. • 1/4 yard of a single fabric to use in the workshop. • If you prefer to bring your own sewing machine and tools, please feel free to do so – just let us know if advance and plan to arrive one-half hour early to set up your machine. Whether you are traveling from afar or from just down the road, we've put together some information [pdf] to make getting here easier, and to help you plan an entire weekend in the area.